This a list of work and repair categories that will eventually be covered. I have no particular specialty, so this list probably looks like what happens with untreated ADHD. The BOLD RED items are working. These Handyman pages are an extention of my Tractor website. More topics will be published as I have time to create them. With a little information anyone can fix just about anything, most of the time. OK, that will be very optimistic for some, and extremely pessimistic for others. So What! It's important to approach repairs with the right attitude. What is the right attitude? Fact-1 Whatever it is, it's already broken. We probably need a new one. Fact-2 Any attempt to repair it may only break it more thoroughly. Fact-3 A repair done poorly will soon fail. Fact-4 Whatever it is, this is NOT a unique problem. GOOGLE IT ! Attempting any repair should always be a learning experience. Go on-line and find out what others have done right or wrong when faced with the same problem. The World Wide Web has become an incredible treasure trove of information as long as we read enough responses to weed out the mis-information. Poor quality tools handled by people unaware of the damage they can do have doomed many repairs. Failures are part of the learning process. If there's a knack to doing repairs, it's taking care not to make the problem worse. Look at the screwdriver in your hand. Is the blade rounded? Is it the correct size and type for the fastener? Failures are most often caused by very simple things. Doing work yourself is an excuse to buy tools! Start small, buy the best tools you can, learn to properly use them, and take care of them. "Good Tools" do not have to be the most expensive. I often get very good service out of "homeowner" grade tools. I favor Craftsman and Stanley Hand Tools, Black and Decker Cordless Tools, Delta Stationary Saws and Sanders. These have all given great service, for the money spent. I apologize if your favorite brand isn't listed here. There are certainly some brands that are better quality. I don't dispute that in any way. However, I cannot recommend more expensive tools when something moderately-priced, will work just fine for the typical weekend warrior. This is particularly true for cordless tools. The battery is the heart of any cordless tool. It makes no sense to invest top dollar for a premium brand name, when the battery technology is no different from any other similar cordless tool. Batteries that are properly charged will only last 3-5 years. Replacement battteries cost nearly as much as a new tool with the latest battery technology. I see no benefit to paying twice as much for premium cordless tools that might last longer. For corded tools (drills-saws) and air tools, my first choice is used, contractor-grade tools. These are often sold at the end of a building season. Many of these may look beat-up, but have plenty of useful life left for personal use. This is the best way I've found to get great tools for about 1/4 what they cost new. Using "experienced" tools may help overcome a slight lack of experience. STEP AWAY from the cheapest tools. The cheapest tools are always junk. You just end up spending a lot more money buying and breaking tools. Not to mention the time lost when tools break in the middle of a project. Rule No.1 – Locking pliers should not be your favorite tool! Rule No.2 – Any hardware touched by locking pliers, goes in the trash. Locking pliers are an absolute last resort, when proper tools will no longer work. It is always much better to use the proper size and type of tool for the fastener. The intent is to always remove fasteners without damaging them. Any fastener that does get damaged, should be replaced with new. Mangled hardware just creates new problems. I do have some locking pliers. Sometimes there is no other alternative when someone has already knocked all the corners off a fastener. Make sure any locking pliers you buy are the original Irwin Vice Grip ® brand name tools. All of the cheaper knock-offs are worse than useless. If you must use an adjustable wrench, do yourself a huge favor and buy the Stanley 85-610 - 10" MaxGrip® Locking Adjustable Wrench. 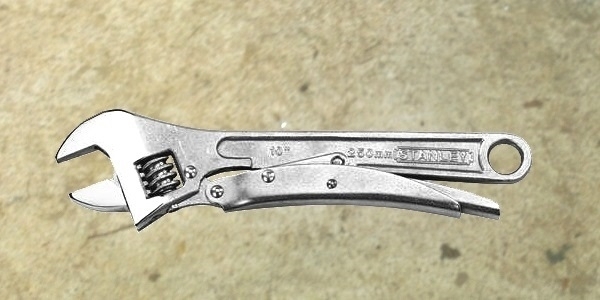 This looks like a standard 10" adjustable wrench, with a strange lever added to the handle. Tighten the thumb screw to the nut, then clamp it with the latch. The combination of smooth jaws, and the locking clamp, grips firmly, and will not tear up fasteners like other adjustable wrenches, vice grips, or (shudder) Pipe Wrenches. 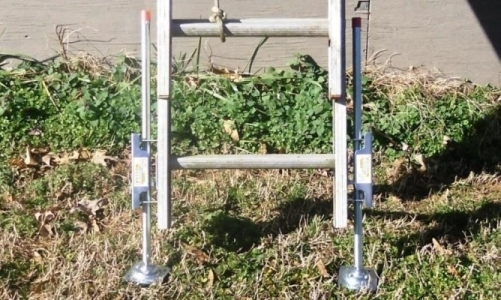 This is possibly the greatest accessory for anyone who uses an extension ladder. Called levelers, the pair I bought are branded "Ladder Pro". Remove the useless floppy feet that came on your extension ladder, and bolt one of these to each side. Now, when faced with uneven ground, just press the latch on the high side or low side to adjust one or both feet. Now the ladder is standing straight, safe, and secure on two feet. For around $50 these are worth every nickel. The neck you save, may be your own! Ladders are dangerous. There is the obvious danger or falling off. There is a slightly less obvious danger of soft or uneven ground. Even level feet can sink in sodt ground, or slide if the ladder angle is too flat. One pet peeve of mine are the special hooks, slots, and holes provided at the top of my "A" frame latters for storing tools. These convenient features promote the habit of leaving stuff at the top of the ladder. That is a bad habit for people with short-term memory issues (like me). A hammer falling from the top of an 8 foot ladder could crack your skull. Wear a tool belt. Keep your tools on the belt. We are often advised to take things to a "professional". That is often very bad advice. Look up the definition of "professional". By definition, a professional is someone who is paid to perform an activity or job. The word "professional" is as overused and completely useless as "heavy duty". It is generally assumed that someone who earns their living in a particular trade would know what they are doing, and care enough to do a good job. Sadly, time is money, and profits are often more important than repeat business. Paying for service or information creates an illusion of additional value for the gullible. We all want to believe we are getting good value for money spent. We hired a professional builder for a major addition to our house. The addition included a new bathroom. The plumber used PEX pipe. When they finished, I decided to replace the original copper pipe in the old part of the house with PEX. The copper system was very old and beginning to fail. It was also an opportunity to buy new tools. PEX pipe uses crimp-on connectors that require a special tool to install. I replaced all the piping for the original kitchen, bathroom, and laundry myself. In the last 15 years we have had three major episodes of leaks. All three failures were caused by crooked crimp sleeves improperly installed by the professional plumber for that one new bathroom! There have been zero failures in the pipes I installed using a manual crimp tool. We are generally much better-off looking for an amateur or hobbyist for advice and repairs on vintage vehicles and antiques. Many of the techniques used to trouble-shoot and repair older machinery are no longer in common use. The ability to listen, look, and figure out what is wrong, has become a lost art in many repair shops. Computers give technicians a list of parts to replace. If that does not work, they go back to the computer for a new list. Customers often pay to replace parts that were not broken. Those professionals will often say something cannot be repaired, and you need a new one. My usually silent response is "wanna bet". The truth is that many repairs will just take more professional time than most customers are willing to pay for. Vintage vehicles are worth more when they have original parts. Working on any vintage equipment is much more fun, and rewarding when we are able to restore original parts. I've been taking things apart since I was a very small child. Many early lessons were learned the hard way. The mystery of electricity was made painfully clear by unscrewing a bulb and sticking my small finger in the hole, OooohhZIT ! Electricity is easy. Bulbs glow brightly because they are being tortured by electrical current. Thankfully, my diagnostic methods and tools have improved over the years. I'm either older and wiser, or my fingers have been burned so many times, they are no longer sensitive enough. I grew up building plastic and balsa model kits and built a few airplane and boat models from scratch. My first real car naturally led to car repair. I set-up my first differential ring and pinion gear at the age of 17. The special tools I needed were less expensive than paying someone else to do the work. That gear set was still working after several years of street use, and weekend drag racing. The same rear end was in my circle track race car for three years, and was still working when I sold that car. I still have the special tools today. At one time or another I've disassembled just about every type of machine, device, or appliance. If it breaks, I'm going to take it apart to see if it might be fixed. My success rate is far from 100%. That's perfectly ok, anything repaired is money saved. Anything that cannot be repaired is a learning experience. DANGER lurks in many places when we start turning screws. By the time I pulled a microwave apart, I was already familiar with capacitors. Capacitors are typically small barrel-shaped objects with terminals on one end. Small capacitors 1/4" or so are often used in electronic equipment to stabilize current flow. DO NOT mess with these things until they have been discharged! Any charged spring or pressurized container has similar properties. They must be discharged or made safe before taking them apart. The microwave oven is mentioned above because that appliance had a truly impressive beer can size capacitor! This is basically "canned lightning", definitely not a toy! MINITURIZATION has made repairs more difficult to accomplish. Computers and electronics have become more and more miniaturized. The first desktop computers had plenty of air around the various internal components. It was relatively easy to get in there and install upgrades. Every year they get smaller and more powerful, while manufacturer's seem to pay less and less attention to repair. I recently upgraded memory in my NetBook. Components had to come apart in layers. Getting all those circuit boards and microscopic screws back where they belonged was a trial. While I have practically zero formal training in any specific field, I do have many years of practical, hands-on, experience at all sorts of repairs. Something I inherited is the ability to soak up practical knowledge first-hand, or from a manual. Now with the internet, the answer to just about any question can be found in a few moments. Do not waste time with YouTube videos unless you have a great internet connection and lots of time to listen to useless babble. A short, written description, with maybe a photo is a much faster download that can be printed and carried out to the shop. Learn to filter internet searches using the minus sign (-) in front of things you do not want, (-YouTube) is one of my search exclusions. A few people have asked for videos to be added to this web site. Maybe one day, when internet access in the country actually allows uploading and downloading video in a reasonable amount of time. When taking anything apart, I learned to place each piece in the order and same orientation it came off. Then, when It's time to put things back together, the parts will be in the correct order and facing the right way around. Do not let some curious bystander start fiddling with your nice neat arrangement. Projects cannot always be completed the same day. Some of my projects have taken years to complete. When parts cannot be left in a neat arrangement as they came off, take pictures of everything. Thank the Lord for digital cameras! Once I started taking digital pictures, it was only a small step to posting them, and this web site was born. Information is easier than ever to find. There are plenty of repair sites and forums on the web where you can get specific information for any problem. Search for make, model, year, and the problem you are having. Chances are your problem is far from unique. In most cases someone has already fixed it, and posted the procedure. People are great! The web gives us many ways to help each other. It is truly staggering to read some of the forums and realize how many people are spending hours of their own time just helping others. The bad news is that free advice is often worth less than you paid for it, mine included. Hopefully not OFTEN, but I do not claim to be infallible. Most forums on the web are great places to get information, as long as you are patient, and stick around long enough to get the best advice. You don't have to read many posts to figure out which people are giving the best advice. If you are doing any work on your home or out-buildings. Check your local building codes. In most cases you are required to pull a permit, even when you are doing repairs in your own house. Some localities require homeowners to pass a test before they can do work in their own house. You nearly always need a license and insurance if you are doing work for someone else. The exact process and fees for pulling a permit vary by locality. Depending on the type of work, and size of project, you may need sketches, drawings, or even engineering calculations. Building codes and local ordinances are minimum standards. "Almost to code" is never ok. In many cases farm buildings are excluded from permit requirements, but that is no excuse for not making sure they are built to meet codes where applicable. If you got here from a link on another page, use your browser BACK button to go back.